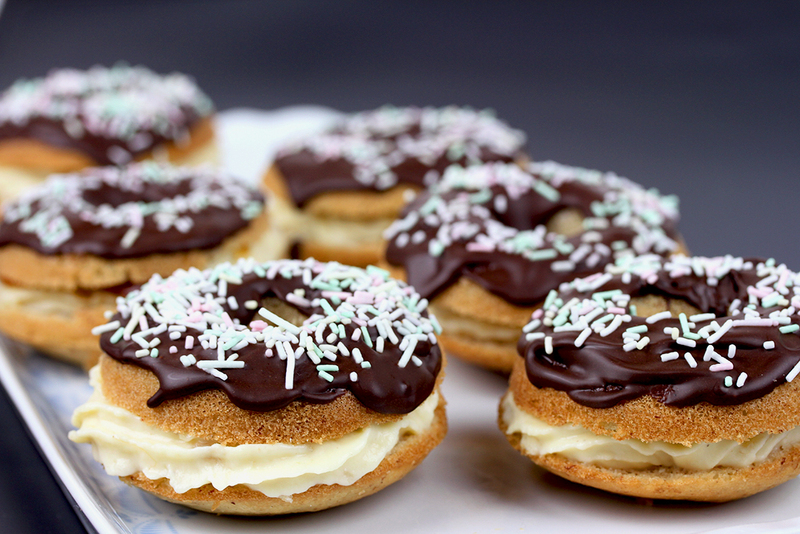 Absolutely delicious baked, gluten-free, vegan Banana Cream Cheese Doughnuts. It’s National Doughnut Day! Ok, I’m not a national, but who cares? Doughnuts need to be celebrated from time to time ;)! I haven’t made any doughnuts since last year – that was a looong time. 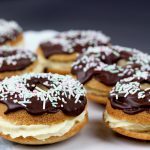 This is a very easy recipe: I used a standard doughnut recipe, added a mashed banana to the dough, baked the doughnuts in my doughnut pan, sliced them horizontally, filled them with banana cream cheese, drizzled some caramel sauce over the cream cheese and topped them with chocolate … sooo delicious :)! My doughnuts were also sugar free (I used xylitol wherever I state sugar in the recipe and I also had sugar-free chocolate chips), but that’s up to you! Ok, not 100% sugar free … I went a little bit crazy with one of my doughnuts and made a ‘Feuerzangen-Doughnut’ – that was fun :)!!! If you want to try this, you need a small sugarloaf or sugar cubes and some rum (54%). Layer some cream cheese and/or banana slices on top of the doughnut and place the piece of sugar on top. Carefully pour some rum over the sugar and light it. Make sure to switch off the lights to fully enjoy the wonderful blue flames. But be very very careful with the fire please! Preheat oven to 350°F (180°C) and grease a doughnut pan. 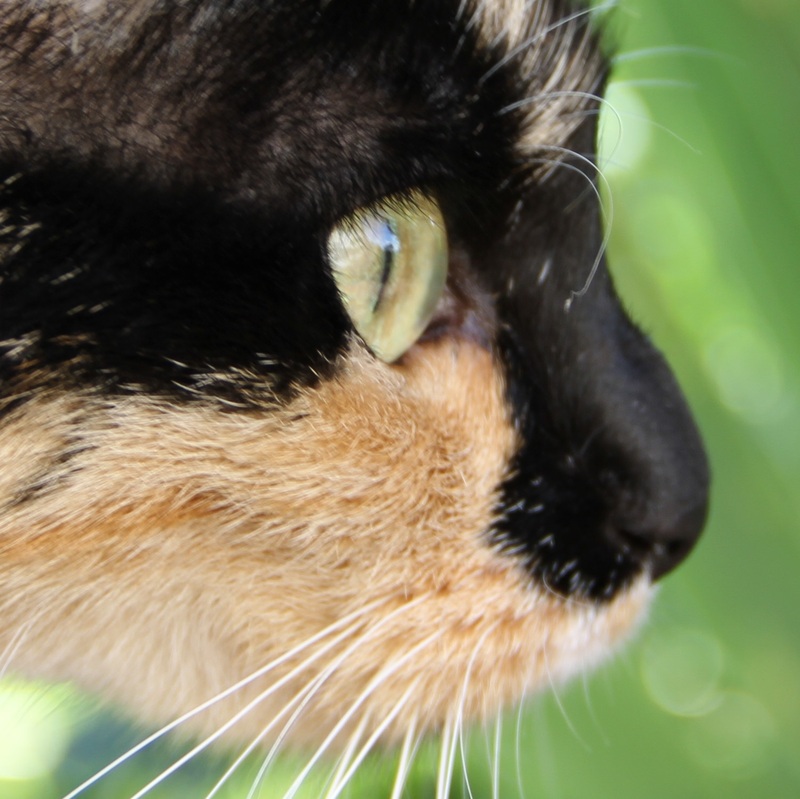 In a medium bowl, combine flour, sugar, baking powder, cinnamon and salt. In a separate bowl, combine mashed banana, coconut oil, milk, lemon juice and vanilla. Add the liquid ingredients to the dry ingredients and mix until well combined. Fill the mixture into the prepared pan - you should get 12 doughnuts. Bake for about 12 minutes, and allow to cool slightly before removing the doughnuts from the pan. In a medium bowl, combine butter, cream cheese, sugar and mashed banana. Slice the cooled doughnuts in half and fill with the cream cheese mixture. 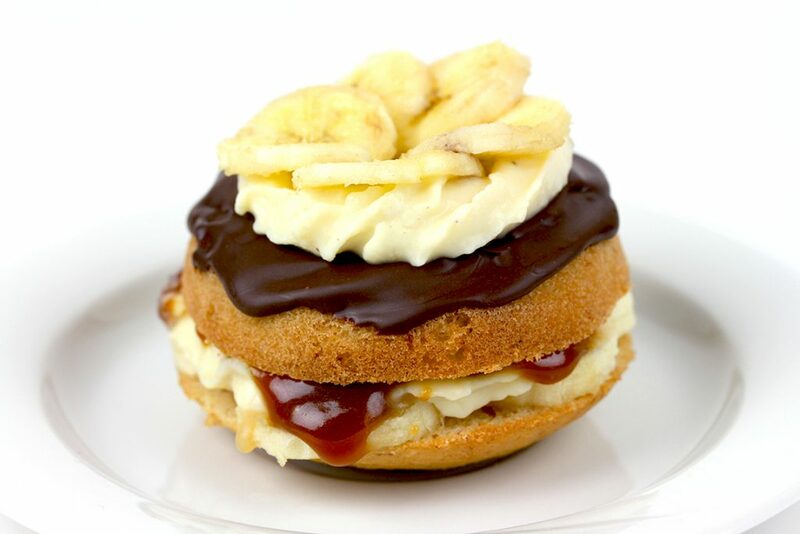 You may optionally top the filling with banana slices and/or caramel sauce. Melt chocolate chips and coconut oil. Let cool slightly. 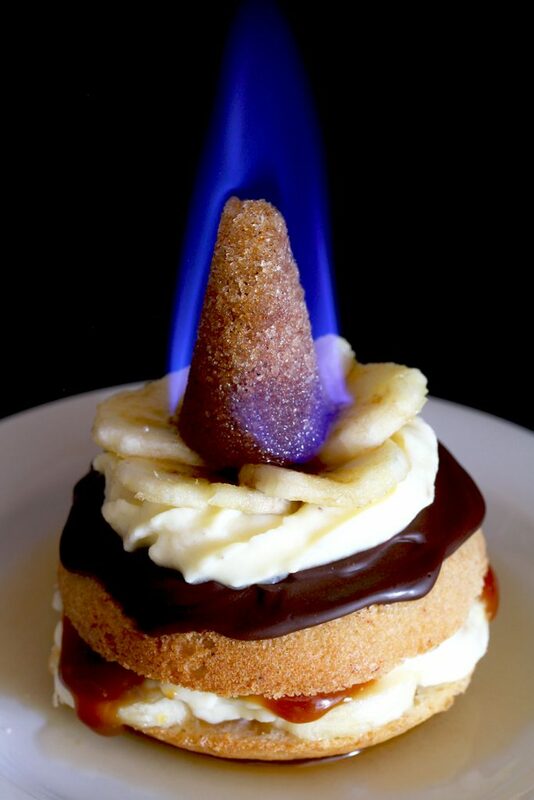 Spoon chocolate over the top of the doughnuts and optionally garnish with cream cheese mixture and banana slices.